We had some snow over the past couple of days here on the Coast. In some parts of the Lower Mainland it was really snowed in and a fair amount fell here in the city yesterday as well. Of course, by today it's all turned slushy. A shame. Because I love the snow, always have, ever since I was a child. I was born on the Prairies so snow was a big part of my early childhood. Later we moved to Ontario where the winters are also long and cold. I remember walking to school along the road with the snow banks piled higher than my head, and taking a short-cut across the river on the ice. When we moved to the Coast in 1947 I was afraid there wouldn't be any snow. In fact, my mother made me give away my skis. But much to my delight, there usually was a bit of snow in winter time. And on rare occasions it even got cold enough skate on Lost Lagoon in Stanley Park, and go sleigh-riding on the hills. For several years in the '60's I lived up north again, in Edmonton, and there it was very cold in winter. I recall on winter when, with the wind chill, it was 90 below F. for a solid week. Everything stopped. Schools were closed, mail delivery suspended, and everyone stayed indoors bundled up. We even got certificates to commemorate the excessive cold snap. So here on the mild west Coast where when it does snow it doesn't usually stay around for too long, and it never gets that excessively cold, I can't understand why people complain. Of course, funny thing about the Coast, people complain in summer too. When it's rainy too late in the season, they complain. When it warms up they complain it's too hot. When it rains again, they complain about that and when it snows, it's a major disaster. After all, it IS winter. And it's no surprise when it snows here as it always has at some point during December to February. It was fun yesterday to see kids out on sleds. It reminded me of when I was a child. We always had lots of fun in the snow building forts and having snow-ball fights. In Edmonton it got cold enough to flood the back yards and have your own skating rink. So, I'm glad it snowed. And I wish it would stay longer, and not get all slushy and soggy like it always does here. Winter is fun. Especially when the sun shines and the sky is blue and all that white stuff sparkles! Who am I? A friend was asking me why I have a different name on my blog. The name says "Wynn Bexton". And why didn't I change it? "Because,"I said, "that's my other name!" Well, actually, it's my pen name. However I've come to really like that name and don't mind at all if people call my "Wynn". After all, it's actually a Welsh name, kind of a derivative of my real first name "Winifred". And "Bexton", which surely has Saxon roots, was my mother's maiden name. I chose "Wynn Bexton" quite some time ago as a great name to use for writing and publishing historical fiction. So, that's my other name, and I'm sticking with it! I do have other personas, besides the 'real' me, though. Because I'm a Gemini, I'm allowed to have more than one, actually several. Since I was a child I always loved costumes and pretending to be other characters. When I was a teen, I considered using the name "Cam Alexander" as I thought that sounded cool. Nobody loves it more than me when there's a chance to dress in a costume and assume a different role. I've put up pictures of me dressed as a few of my favorites here on my blog. I wish I had the photo of me as "Miss Piggy". That was a hoot! 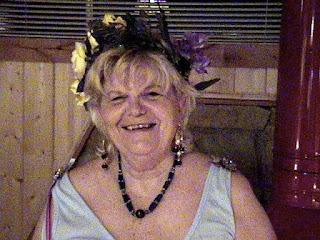 The first picture on this page is me as Persephone, the Earth Mother. My writer's group often has these theme weekends when we go away for writer's retreats. That one was the Rites of Spring. I really liked playing Persephone and think she suited me. This next picture is me as my writer-hero, Jack Kerouac. This was a retreat where we got to dress like our favorite literary hero and read from his/her writing. And actually I adopted this 'costume' as my writer's garb and often wear it, especially the little black cap which has become a sort of my signature. I have one of my Jack Kerouac photos up on Facebook and another writer friend of mine says I should use it for the cover of my novel when it's published. Me, as a pirate. Aargh, Matey! This third picture is me as a pirate. I am certain that in another life I was a pirate or a gypsy. I've always been intrigued by these characters. And the life I lead is a rather gypsy/pirate sort of life (well, I don't plunder and raid, but I do travel a lot and I am fond of exotic destinations.) When I was a kid I was fascinated with pirate stories, next came Robin Hood, then Zorro. 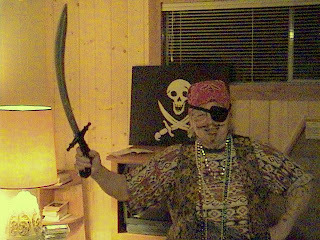 So when we had a Pirate's Weekend on one of our writer's retreats I jumped at the opportunity to dress up like one of my storybook characters. Aaargh, matey! Well, who am I anyway? I'm a kid at heart, a gypsy - that's for sure - and a true romantic/adventurer. 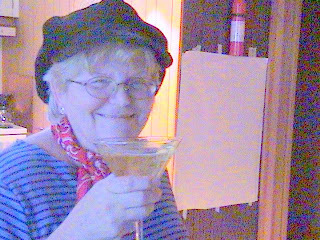 I'm also a mother, grandmother, sister, auntie and friend to many - young and old. I'm a writer and a dreamer, sometimes an artist, and a singer. Once I wanted to be a jazz singer, but I mostly sang in church. I'm a lover of jazz and Latin music and classical too. I listen to music constantly. I love to dance and wished I could have been a ballerina. Once I studied flamenco dancing too. I love words and books. I love travelling and I'm a travel journalist. I love life. And I'm glad I'm ME.